Making carpets at D. Nuno Álvares Pereira in Arraiolos. We visited two stores in particular with hand-made carpets, each of which had experience in shipping to the U.S., and even making carpets on specification to U.S. customers. (ask for Maria, who speaks English). Tapetes de Arraiolos Califa, Lda. (general manager, Alfredo Barbeiro, who speaks excellent English). "Arraiolos carpets are, in their polychromatic weaving, one of best-known affirmations of the Portuguese people's artistic genius. "Primitively of Persian inspiration, the Portuguese embroideries started their manufacture, totally by hand, during the 16th century, impressing on them the best of their personal art, a product of their own taste, the artistic tendencies of the great Alentejo Plain. "The motifs which appear printed in the fabric range from very small arabesques of Persian origin, which represent the 16th century (a first period), to the big floral designs (a second period), corresponding to the 17th century and reaching a more refined characteristic form in the third period (i.e., the 18th century), maintaining still today the same manufacturing processes and their traditions." "In 17th century Lisbon, laying and setting rugs in San Roque was a task for the slaves that the men of the Age of Discoveries brought back to the capital of the empire. It also was a privilege enjoyed by the wealthy men that gathered around the Temple of the Company of Jesus to listen to the sermons of Father Antonio Vieira. "The rug, as an elaborate cultural expression, a reflection of power and abundance, becomes in the different cultures that it represents, an important element of social, political and religious life. "There is a vast number of documents (texts and paintings) that refer to the function and the role played by the rug in different social and economic contexts throughout the ages. "There are early references to the Arraiolos Rug -- embroidered with wool (oblique or Slavonic interwoven cross-stitch) worked on canvas (linen, oakum, jute or hemp) in counted threads -- in the end of the 16th century, which testify to its making in this village of Alentejo. "Several documents in the same inventory between 1598 and 1700, mention the existence of embroiders, the making of the rug, as well as the presence of craftsmen -- carders, fullers, dyers and weavers -- that dedicated themselves to the treating of the wool and the making of the canvas. The Arraiolos Rug had in its initial stage -- last decade of the 16th century / first decade of the 17th century -- a Moorish origin. It contains a pre-decorative setting -- border, field and center ( whenever it has the central ornament) divided in four parts (quarters) -- dominated by the same principles that define the Persian rug. "With the expelling of Jews and Moors from Spain by the Catholic kings and the beginning of the exodus, along with the temporary settlement of these peoples in Portugal, until 1511 -- when Manuel I forced them to resume their journey to the north of Africa -- various people decided to settle down in Arraiolos, due to the warm welcome, the abundance of herds, of excellent wool and the diversity of plants, indispensable to the dying and making of canvas, together with the sensitivity and work capacity of the villagers. "Witht eh presence of Jews and Moors, by now "New Christians," the Arraiolos rug gains a new expression, a greater vitality. "The examples executed in this period, during most of the 17th century, reveal a strong Oriental influence -- with a profusion of motifs from Persia, Iraq and India, associated to a rich chromatism and geometric drawing, delicately elaborated. In some of these examples, the major part of the motifs was delineated in "pe-de-flor" stitch. In others, one can find the influence of motifs taken from the Spanish rugs of Alcaraz and Cuenca. "Little by little, the presence of Oriental motifs diminishes and they start to be replaced by anthropomorphic motifs (end of the 17th century / beginning of the 18th century). The colors become less rich and the decorative elements are more scattered. "Without the presence of the Oriental motif, the examples of the end of the 18th century/ beginning of the 19th century, reveal a strong presence of vegetal elements with poor colors. "On the one hand, there are many families in the village that, throughout three centuries, have found in the making of Arraiolos rugs a new way of expression, a source of work and a means of earning money. On the other hand, in the convents around Alentejo, nuns, in the seclusion of their cloisters, have found ways of expressing their inner faith, creating some of the best examples. "In the end of the 19th century, the making of Arraiolos rugs practically did not exist, being reduced to the presence of embroiderers that made rugs by order, as well as those that were made by the women of the village for their own households, during the long winter nights. "During this period, the shortage of means resulted in the making of rugs in natural colors such as whites, browns and coarse woolen cloth. 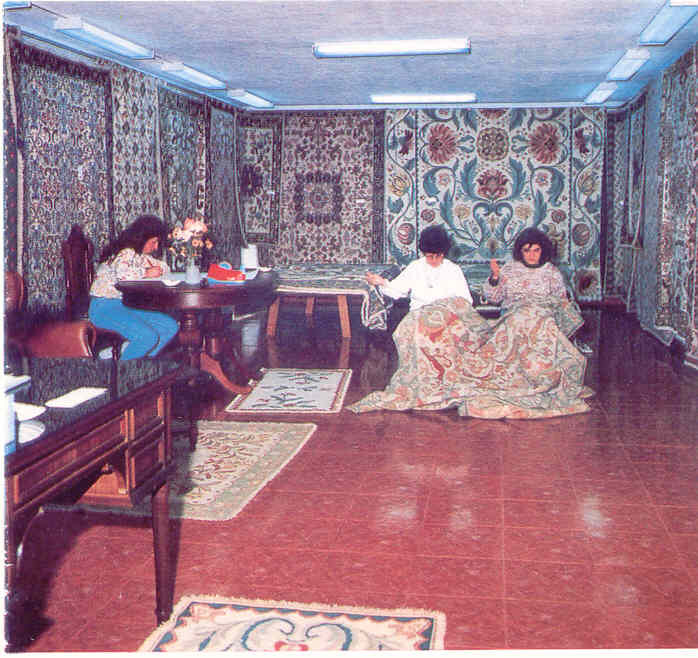 "With the beginning of the 20th century, the "rebirth" of the Arraiolos rugs occurs -- a group of women from the village recreated models, based on those which, in different eras, had been unsurpassed examples of the Arraiolos rugs, thus creating a new era." Last updated October 5, 2002.